Mysterious abductions and disappearances. Plagues of deadly snakes and mutated insects. 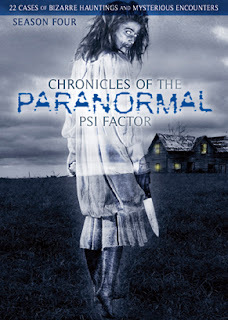 Poltergeist attacks, psychic predictions, and demonic possessions…PSI Factor: Chronicles of the Paranormal will change the way you perceive reality. In 22 episodes, a fearless team of investigators from the covert Office of Scientific Investigation and Research (O.S.I.R.) explore bizarre, top-secret cases inspired by real, documented events. As O.S.I.R. agents face the supernatural in their search for clues, their quest for truth is often stranger than fiction itself. Extraterrestrial experiences. Mysterious disappearances. 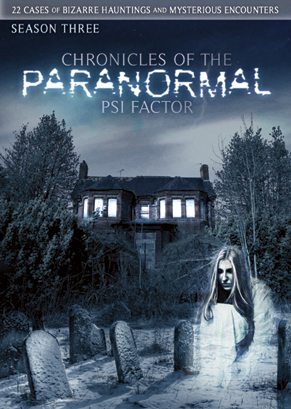 Eerie hauntings…Chronicles of the Paranormal: PSI Factor will change the way you perceive reality as a fearless team of investigators from the covert Office of Scientific Investigation and Research explore bizarre, top-secret cases inspired by real, documented events. This season, the group faces even more out-of-this-world mayhem and loses one team member…only to be surprised by the return of another. 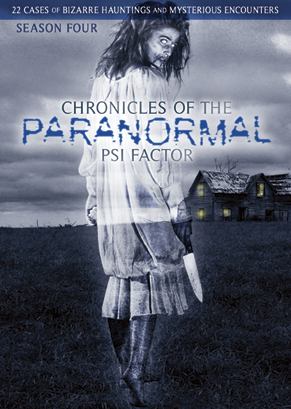 Hosted by Dan Aykroyd, PSI Factor will lead you on a quest for truth that is often stranger than fiction. 5/5... 5/5... Okay I must say this loud and clear, Echo Bridge knocks this one out of the park, this show was one that sort of competed with "X-files".. though was never shown the love. I loved to watch this show and I am glad to have been able to at least watch a couple of the complete seasons... I am not sure what the hang ups are on the first two. Here we have the complete Season THREE and FOUR as each episode takes you on a paranormal journey. Single sided DVD's neatly packed into their housing box... my only complaint is that they are not numbered. But the box has the episodes listed by number and the episode names are on the DVD, it's a little extra work... but it's a fun show and it here for a reasonable price. Make sure you look for these covers, their are a mix of incomplete version out there and I want you to get the right one.